Heavyweight Champion of the World from 1919 to 1926. The legendary Dempsey was born in Manassa, Colorado, one of 11 children. At 16 he left home and traveled on freight trains and fought to earn money. Then Dempsey met manager Jack ‘Doc’ Kearns and started knocking out legitimate contenders like Fireman Jim Flynn, Fred Fulton, former Light Heavyweight Champion Battling Levinsky and Gunboat Smith. 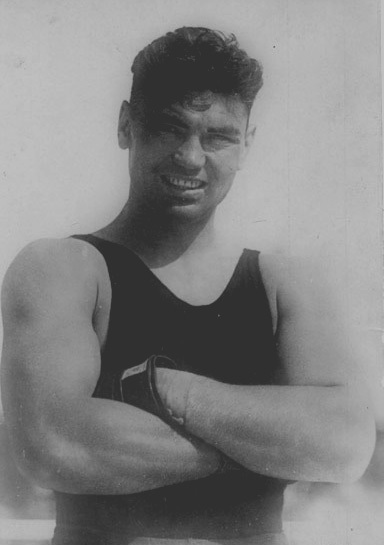 On July 4, 1919, Dempsey met Heavyweight Champion Jess Willard on a sweltering day in Toledo, Ohio. Bobbing and weaving, Dempsey closed the gap on the much taller Willard and knocked him down 7 times in the first round. The carnage continued for 2 more rounds until the fight was halted because Willard couldnt answer the bell for the fourth round. As Champion he fought Billy Miske, Bill Brennan, Georges Carpentier, Tommy Gibbons and Louis Firpo. He was inactive in 1924 and 1925, and in 1926 he took on Gene Tunney. A classic matchup of the boxer versus puncher, Tunney, a former Marine, moved side to side and threw combinations which befuddled Dempsey and he lost the title on a 15 round decision. In September of 1927, Dempsey got a rematch with Tunney at Chicago’s Soldier Field. Tunney was outboxing Dempsey once again but got dropped in the seventh round. In one of boxings most controversial moments, Dempsey instinctively hovered over Tunney waiting to hit him as soon as he rose. But a new rule had been adopted that if a fighter scores a knockdown he must go to a neutral corner. The referee spent several seconds ushering Dempsey to a neutral corner, then started the count. It was estimated that Tunney was down for 14 seconds before he rose. Tunney went on to win the fight by decision, and the ‘long count’ became boxing lore. Dempsey retired after the Tunney fight with a record of 60-6-8 with 50 ko’s, and his popularity became huge for he was considered the peoples Champion because of the long count. He opened a restaurant on Broadway in New York City and it quickly became one of the citys most popular spots. 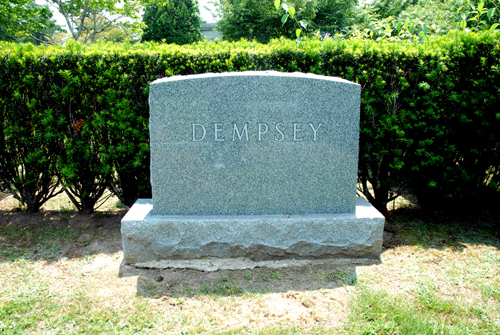 Dempsey himself was often in the restaurant to greet guests, sign autographs, and pose for pictures. The restaurant closed in 1974 after a 39 year run, and Dempsey passed away in 1983. 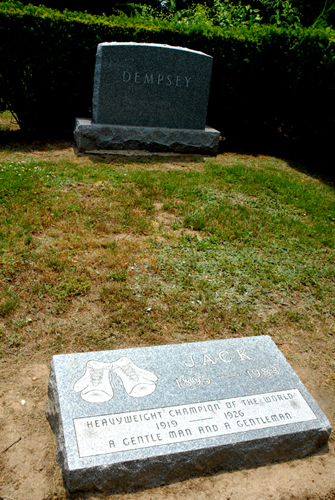 In 1990, 7 years after his death, Dempsey was inducted into the International Boxing Hall of Fame. Stone is not the grave but the back marker for the section which also contains another grave.